Heavenly Mountain Resort, CA/NV – November 20, 2013 – Heavenly Mountain Resort, near South Lake Tahoe wants to develop a lift-access mountain bike park as part of their new Epic Discovery. In addition to the bike park, Heavenly wants to add zipline and skycycle canopy tours, a ropes course, water activities, hiking trails, mountain excursion tours and nature interpretation. 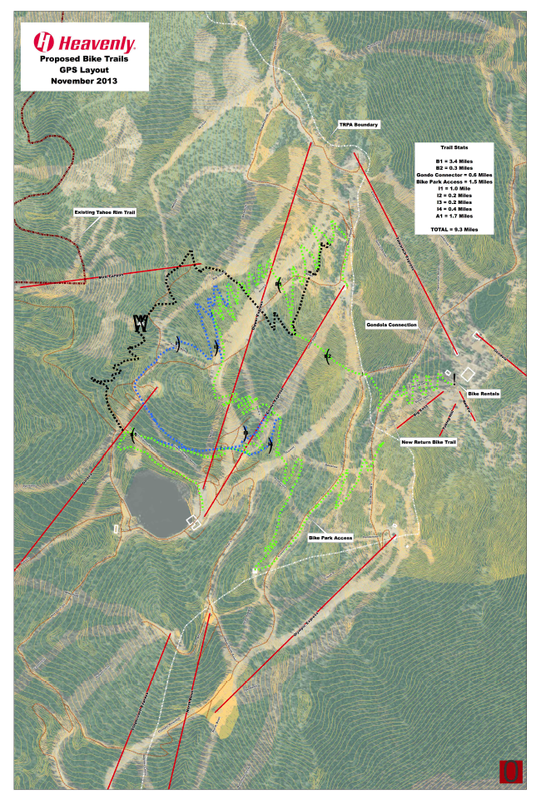 As part of their comprehensive review process and response to the Heavenly Mountain Resort Epic Discovery Project, the USFS has announced the opening of the commenting period for the Environmental Impact Statement (EIS) and the Environmental Impact Report (EIR) components of the proposal. According to the report, construction of the mountain bike park would start in 2015. Heavenly plans to build 8 to 10 miles of trails that will be oriented towards beginner to intermediate riders. Worth noting however, MtbParks has seen some conflicting comments on the subject indicating there may be trails for expert riders as well. Some riders will get a free ride at Heavenly Mountain Resort, based on plans to connect the park trails to the Tahoe Rim Trail and the Van Sickle Bi-state Park. The first trail connection is intended to connect the East Peak Mountain Bike Park to the Tahoe Rim Trail. The second trail connection is intended to connect the mountain to Heavenly Village. Gravity riders, however, will still pay for lift access in order to ride the gondola, which would access the bike park trails via the Dipper, Comet and Tamarack chairlifts. Comments concerning the scope of the analysis must be received by December 20, 2013. The draft EIS/EIS/EIR is expected in August 2014 and the final EIS/EIS/EIR in January 2015. Please send your written comments to: Heavenly Epic Discovery Project, TRPA, P.O. Box 5310, Stateline, NV 89449, Attention: David Landry, or email: dlandry@trpa.org. If applicable, responses should include the name of a contact person at your agency or organization. TRPA’s Advisory Planning Commission will discuss the proposal Dec. 4 at 9:30am at the agency’s Stateline office. The Forest Service will host a workshop Dec. 18 from 5:30-7:30pm at the South Lake Tahoe office, 35 College Drive. Some riders will even get a free ride at Heavenly Mountain Resort, based on plans to connect the park trails to the Tahoe Rim Trail and the Van Sickle Bi-state Park. The first trail connection is intended to connect the East Peak Mountain Bike Park to the Tahoe Rim Trail. The second trail connection is intended to connect the mountain to Heavenly Village. Gravity riders, however, will still be required to purchase a ticket to ride the gondola in order to access the bike park trails and the connecting Dipper, Comet and Tamarack chairlifts. Credit: mtbparks.com. Click here to read original article.